Don't trust this sea witch! Ursula in all her malevolent glory! Based on the Disney animated classic The Little Mermaid. Collectible statue measures about 8-inches tall. 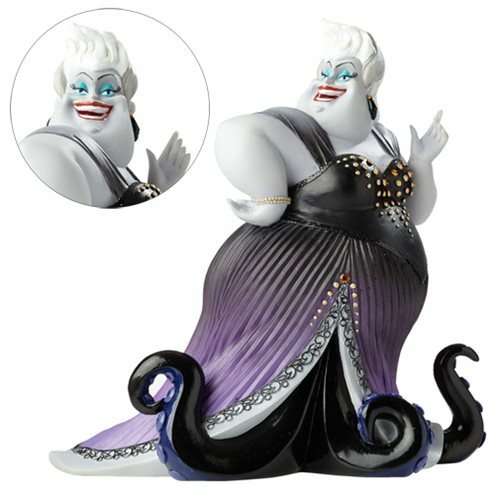 Based on the 1989 Disney animated classic The Little Mermaid, this magnificent Disney Showcase The Little Mermaid Ursula Statue presents Ursula in all her malevolent glory. Expertly fashioned of stone resin, she measures about 8-inches tall x 7 3/4-inches long x 5 1/2-inches wide, ready to rule over Atlantica and your collection! Ages 13 and up. Disney Characters Are Here To Make Your Collection More Magical!